At Ross Farm we have a beautiful nature trail that wines along the shore of Lake Lawson. Included on this trail is a deck that overlooks a scenic marsh area. As the hands-on group walks along the trail a knowledgeable guide will point out different species of birds and animal tracks in their natural habitat. 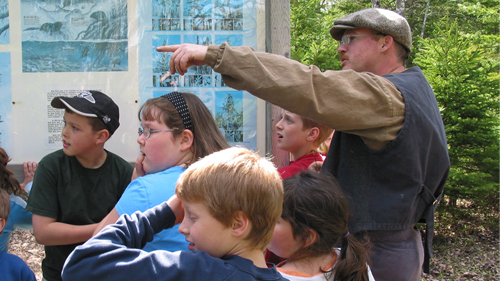 The hands-on group will learn to identify differences in trees, learning which tree is best for build certain things. Identifying these different woods and there uses will tie the workshop and open-hearth cooking together for discussions when you return to school. An example of this is; which wood is best for making snowshoes and which delivers the greatest heat. Inside, after the walk, or on stormy days when a walk in the forest is not possible, kits are used to identify animal tracks and plants along the trail.